For the last couple of years I've been keeping a journal. I try to write in it regularly and one of the things I write about is moments from my day that I am grateful for. 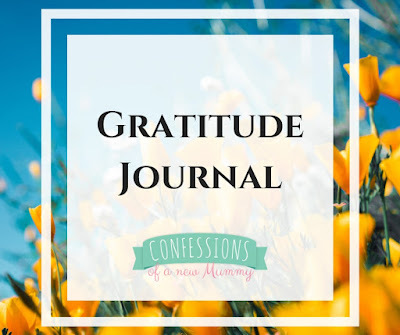 I decided to jot down my moments of gratitude as I had read that focusing on the positive things in life helps to lift the mood and to attract further positive things in to one's life. (This article from the Huffington Post explains what a gratitude journal is and the benefits of keeping one). It has to be said that I'm not naturally optimistic so I'm all for anything that will help to change that so, no matter how big or small something is, if I'm grateful for it, it goes in. * Bugs. Or rather, the girls not getting whatever bug D had at the start of last week. Sunday saw him start to feel poorly, although he couldn't quite put his finger on it. Monday saw him take the day off sick and he had a half day on Tuesday. I knew he was unwell as he's never off his food and rarely takes time off sick! * After having a good 2-3 weeks or interrupted sleep, finally getting a full night without waking up once. Sadly it hasn't happened since but, y'know, I live in hope. * Google. E came home from school with some English homework. I had to google it before I was able to sit down and supervise her. Honestly, if this is what its like in Year 2, I'm screwed as they climb through school! * The last two weeks have been good for me with selling some of my painted things. I've sold a wooden towel rail, a bureau and a glass display cabinet. Not big money but it all helps.... and means I don't feel guilty about starting to paint something new! * School pick up. Or more specifically, the time before, which I've been using to either have a quick walk around the estate or to read a book. I'm enjoying being able to read more, I just need to find some new books to get stuck into. Uninterrupted sleep is always something I'm grateful for!